Before using any foot care products and accessories, spoil your feet in a relaxing foot soak for ten to fifteen minutes (ideally at a water temperature comfortable to your touch). This will not only get your feet relaxed, it will also help open your pores and prepare your skin for treatment. This is the absolute minimum that you should be doing in terms of foot care! Not only will they look so much better, but there will also be less chance of them causing you pain and discomfort. When you cut your nails, be sure to use proper nail clippers, and to cut them straight, not down at the corners. Doing this can cause painful ingrown toenails! Simply file the corners and edges of your nails softly with a file, to prevent any cracking of the nail edges. Unkempt cuticles can compromise all the other hard work you put into keeping your nails looking great. 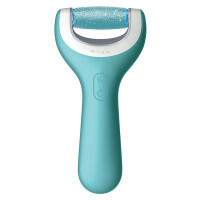 So after giving your feet a soak, gently push back your cuticles, using a rounded cuticle pusher. Be sure to use only dedicated devices for this task. If the cuticle comes away or tears, you can be at risk for infection. Hard skin is a perennial problem for some, but all people are at increased risk of hard and cracked skin in the summer. By taking care of your feet all year round, you can make sure that you don’t have to suffer from painful and unseemly cracked skin and heels! Amopé™ offers products to help you with this, including a moisturizer that helps prevent skin dryness. For maximum ease and efficiency, it is recommended that you use the Amopé Pedi Perfect™ Electronic Foot File with Diamond Crystals. It’s so great to have beautiful, soft looking feet, and our hard skin remover can help you to get them there almost effortlessly. Building a regular routine for hard skin removal enables you to have beautiful soft skin through the summer with ease. Foot creams contain even richer ingredients than normal body lotions and daily use of a moisturizer can help you to get your feet looking beautiful. Amopé Pedi Perfect™ Daily Moisturizer enables you to keep up your essential foot care routine, whenever you find it most convenient. Our foot moisturizer can help your feet stay soft and supple by providing them with moisture, keeping them looking that much more amazing. Applying that SPF25 shouldn’t stop at your ankles, especially if you’re wearing sandals! All too often sunscreen is not applied to feet, which can lead to UV damage and sunburn. To get the perfect tan, ensure regular application of the appropriate factor of UV protection for your skin, but don’t cover them up either! Getting a tan from head to toe can look great, so why stop at your toes?